A man was injured by a polar bear today (Saturday, 28 July) on Sjuøyane. The man survived with injuries, the bear was shot, as the Sysselmannen informed today. The polar bear attacked persons who went ashore from the cruise ship MS Bremen. He is said to be a crew member serving as polar bear guard, preparing a tourist landing. He suffered head injuries; no information has yet been released about serious his injuries are. The man was brought to the hospital in Longyearbyen by helicopter. The incident will be investigated by the Sysselmannen, but first priority is given to provision of medical care to the injured man. 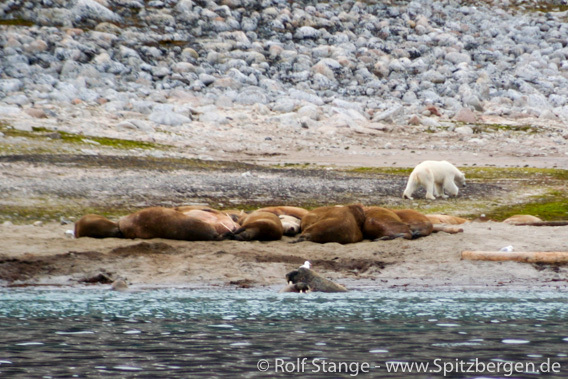 Polar bear on Phippsøya, a frequently used landing site on Sjuøyane northernmost in Spitsbergen (archive image).